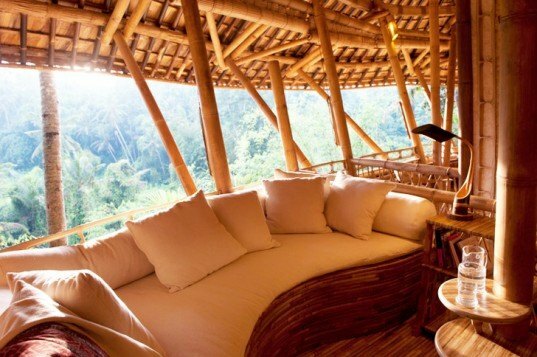 Designed by Ibuku, Bali's Green Village is a community of gorgeous homes built entirely from bamboo. Construction on the village began in 2010, and it continues to grow with the addition of three more fantastic homes (and they're available to rent!). 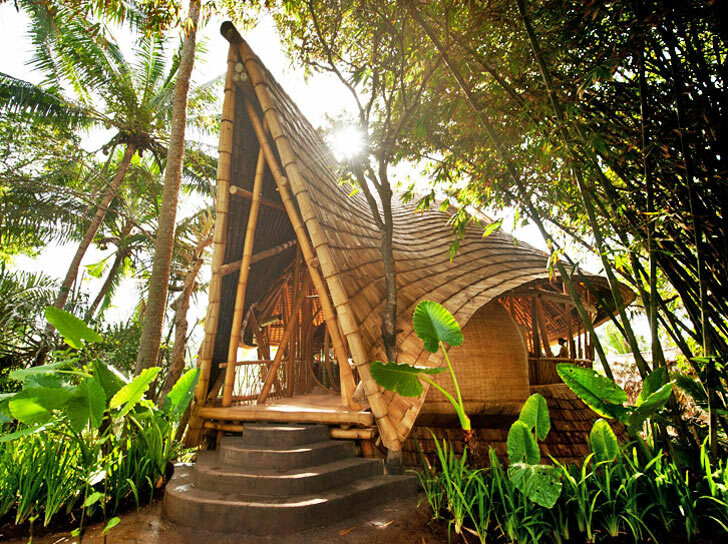 Constructed with locally-sourced materials and traditional building techniques, the Green Village fits in perfectly with the surrounding natural landscape of Bali’s sacred Ayung River. Designed by Ibuku, the Green Village is a neighborhood of beautiful bamboo houses in Bali. Built in much the same way as the nearby Green School, the unique homes are constructed around radial clusters of bamboo columns to which bamboo tile and a thatched canopy are attached. Bamboo is used both as the structure and the dominant element of the interior – the walls, staircases, floors and furniture are all constructed from the plant. Its flexibility enables the creation of sweeping forms that—while maintaining its load-bearing role—can be integrated into natural stone foundations. Playful and lightweight, the structure connects with nature without disrupting it. This unique design can only be learned intuitively and never taught in design schools. One has to learn to live first with nature and appreciate it. Lovely design and Eco friendly concept.I like to receive if any have bamboo all kind of design. I Love what you are doing. The Planet thanks you. Your Designs, Style and ingenuity are commendable. Located in the vicinity of the Green School, also designed by Ibuku, the Green Village was built following the same principles as its predecessor. Playful and lightweight, the structure connects with nature without disrupting it. The bamboo columns attach to the bamboo tile and thatch canopy. Bamboo is used both as structure and the dominant element of the interior. Treated in different ways depending on its function, bamboo constitutes walls, staircases, floors and furniture. Bamboo's flexibility enables the creation of sweeping forms. ”Even sustainable timber can’t begin to compare with bamboo as a conscientious building material."